Most airlines develop their (recurrent-)training curriculum based on glitches, incidents and/or even accidents that have occurred in the past. This means that what is going to be trained has already been gone beyond safe limits, the mistake has actually happened. We try to learn from mistakes made. LOSA stands for Line Operations Safety Audit and is a tool that changes from “learning from mistakes made” to “learning before the mistake is going to happen”. Its main focus is the management of human error. This tool has been developed at the end of the last century in joint cooperation between the University of Texas and Continental airlines and was funded by the FAA. LOSA is proposed as a critical organizational strategy aimed at developing countermeasures to operational errors. It is an organizational tool used to identify threats to aviation safety, minimize the risks such threats may generate and implement measures to manage human error in operational contexts. It enables operators to assess their level of resilience to systemic threats, operational risks and front-line personnel errors, thus providing a principled, data-driven approach to prioritize and implement actions to enhance safety. In 200 ICAO has endorsed LOSA as the primary tool to develop countermeasures to human error in aviation operations, and since then it is the central focus in flight safety and human factors programs. ICAO’s role includes promoting the importance of LOSA to the international civil aviation community, facilitating research in order to collect necessary data, acting as a cultural mediator in the unavoidably sensitive aspects of data collection and contributing multicultural observations to the LOSA archives (containing thousands of observations worldwide). Sky Unlimited can facilitate your LOSA project and uses expert and highly trained observers to collect data about flight crew behavior and situational factors on “normal” flights. Preferably they train a pool of company pilots to be able to act as observer as well. 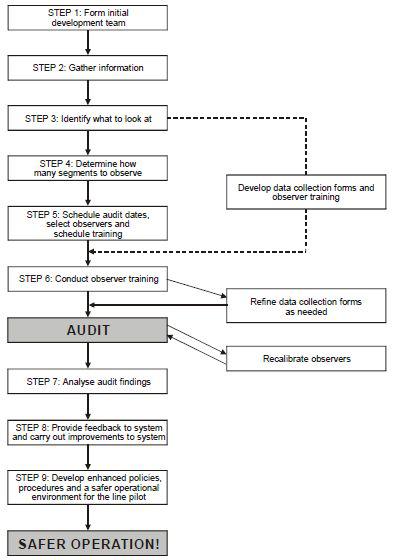 During these audit flights the observer records and codes potential threats to safety, how these threats are addressed, the errors such threats generate, how flight crew manages these errors and specific behavior that have been known to be associated with incidents and/or accidents. Needless to say these audits are strict no-jeopardy audits, the crew will not be held accountable for the observed actions and errors.